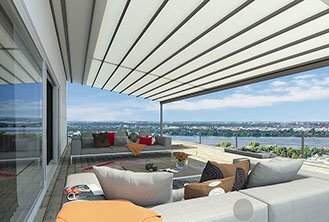 Weinor brings the world’s finest range of custom made Folding Arm Awnings and Retractable and Conservatory Roof Systems to Australia and NZ. We offer an extensive selection of fabrics, frame colours and options including Side Screens, Heating and LED lighting. Sydney, Melbourne, Brisbane, Adelaide, Perth, Darwin & Auckland. Weinor Simulate is an excellent tool to help you see all the awning or patio roof options that go with your patio. Needless to say, the house facade and patio can also be adapted to match your home. This allows you to quickly review what impact your sun or weather protection system will have on your home. Matching colours, fabrics, materials and accessories in 3D with our App. Configure your patio style using your tablet. Extensive range of standard and speciality fabrics. Over 200 awning fabrics to choose from. The Weinor world of colours. The PergoTex II pergola awning from Weinor has received the highest Red Dot award Best of the Best. This prize is awarded for groundbreaking design and is the top prize in the Red Dot award. Only 1.5% of all the submitted products can decorate themselves with this.